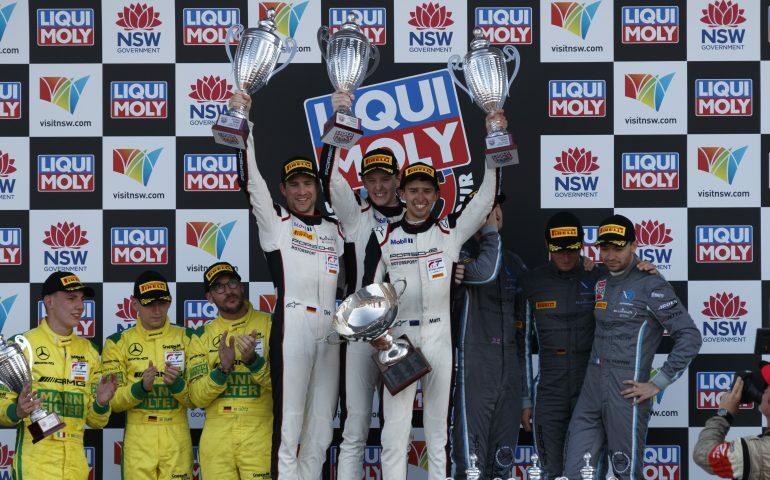 MATT CAMPBELL has opened up about his final stint in the 2019 Liqui-Moly Bathurst 12 Hour, that saw him storm from fourth to take the win in the dying moments. The 23-year-old Australian pulled off a clinical finish to the race after being the only car in the lead pack to take on tyres in the final round of pit stops, using the extra speed to take the lead in the last ten minutes of the sprint to the flag. Despite having a mountain to climb as he emerged from the pits 25 seconds down on Jake Dennis in the lead, he says he gave it his all in the final stint to hunt down his rivals and take advantage of the safety car period. “I knew it was going to be tough, I didn’t know it was going to be that tough obviously with the other cars starting on older tyres when we had fresh tyres,” Campbell said. “After a couple of laps, the team radioed in and said it was around 25 seconds or something like that; I knew we had good speed but I had to knuckle down and give it everything I had. “It was an absolutely phenomenal race I was absolutely perfect towards the end. “I can’t thank these two (Oulsen and Werner) enough, it’s just so awesome to send off the old car like this in its last ever race and also for Earl Bamber Motorsport. Engaged in a long battle with the #42 Team Schnitzer BMW M6 of Chaz Mostert for third place, Campbell was cleared of any wrongdoing after making contact with his fellow Australian at the Chase, causing Mostert to run off the road. “He (Mostert) certainly wasn’t making my life easy, moving over a little bit under brakes but I saw my opportunity,” he said. After getting past Mostert, a safety car period brought leaders Jake Dennis and Raffaele Marciello into sight for Campbell who had to squeeze his Porsche past Dennis’ Aston Martin at Forrest Elbow for the win. “I was really trying to find my time, their cars (Aston Martin) have been competitive all weekend and I knew that was probably going to be my only passing opportunity. In his sixth straight Bathurst 12 Hour, Campbell is now one of only six Australians to win the race in the GT3 era, joining John Bowe, Peter Edwards, Craig Lowndes, Jonathon Webb and Jamie Whincup on the list of local winners.